To date, there's never been a really successful wine show on broadcast television. PBS is about to try a new angle: Hollywood celebrities talking about wine. I learned Thursday that WNET, the PBS station in New York, is soliciting wine samples for early episodes of the show, which I heard is tentatively called "Wine Talk." The celebrity planned for the pilot is Stanley Tucci, best known recently as Julia Child's husband in "Julie and Julia," but dear to my heart as Secondo in my favorite food movie, "Big Night." The show is supposed to have a panel of celebrities moderated by Food & Wine magazine's wine editor Ray Isle. While it would be produced in New York, the expectation is that it would run on PBS stations nationally; that's the way PBS does things. I love the idea. Ask any winemaker within easy driving distance of Hollywood -- Santa Barbara County, in particular -- and they'll tell you of performers who have come to their tasting rooms and shown surprising knowledge of wine. In fact, as I was hearing about this show, I learned of Natalie Portman visiting a Paso Robles tasting room, where the winemaker claimed (jokingly or not) she was carded. I wonder if she was flattered. Moreover, nothing against Gary Vaynerchuk, whose affection for unusual wines moves some people past Cab-Chard conservatism. But I don't think the wine world benefits from having him as its sole TV spokesperson. Can't wait to see Ray and Stanley telling us about how red fruit in Zinfandel, instead of black fruit, actually makes it better with food. And making it funny and entertaining. Bring it on, WNET. I agree, Blake. To all of you reaching for that Flip camera to record your tasting experience, please take some acting lessons and try to make it at least a bit entertaining. I swear I'll pull out what little hair I have left if I have to sit through another dry and lifeless homemade (or even retailer) tasting video. As Don Johnson once said to my wife as he was waiting for another take at the St. Francis Hotel, "It's like watching paint dry." Blake, couldn't agree with you more on Big Night. For me, the best "Food Movie" I've seen. In fact, that movie is a big reason I started to cook. 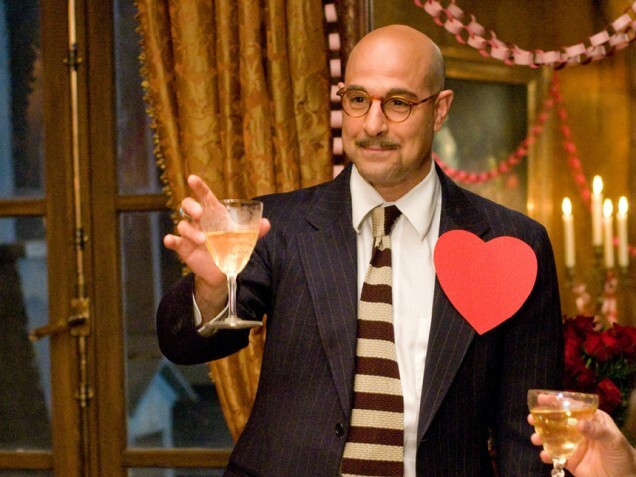 So to see Stanley Tucci rapping about wine would be a cool thing!